When developing SquareTalk, our goal was to explore ways that we could use tacit technologies to foster a sense of connectedness between strangers at large-scale festival events. We underwent an iterative process, exploring multiple ways of connecting people together at large-scale events. We did this by inviting anyone interested in festivals and technology to attend participatory workshops and be involved in the design process, allowing their opinions, visions and beliefs to influence the final outcome of SquareTalk. In these workshops we explored many ways of connecting people together, including social media, social activities and creativity. Ultimately, we found that the most powerful way of connecting people was through creative expression and the sharing of personal experiences. This iterative process led us to the final outcome of SquareTalk – a participatory art installation that connects festival attendees through storytelling. It begins with workshops, where festival attendees are invited to construct a lantern, decorating it with reflective illustrations based upon experiences of change throughout their life. After illustrating their lanterns, they are given the opportunity to record a short reflective audio piece. The lanterns are installed in a darkened room, where festival attendees use a “torch” to bring each lantern to life, illuminating its illustrations and echoing its creator’s reflections throughout the space. It does this using an FM receiver called a Linzerschnitte that allows the lanterns to glow in time with the voice recordings and RFID technology that allow the lanterns to be activated using the torch device. 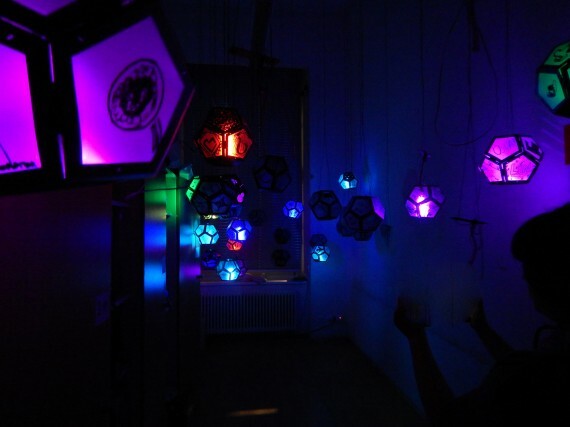 We noticed that when providing a space for festival attendees to creatively express and self-reflect on their experiences, participants began to naturally share these experiences with those around them and connect through the building of their lantern. By installing these lanterns in an interactive space, the experiences of those who built a lantern could be heard and viewed by others. Large-scale festivals do not typically provide an opportunity for interpersonal reflection – the installation gave festival attendees the opportunity to engage with and ponder the experiences of others, whom otherwise they would have never met.